Hey, familiar theme here. I think it's time to revisit the Fields issue. Specifically, I think we are more informed now, though not yet completely informed about what our options are. Anyway, I figured I'd give a heads up that I want to be richer in the fields department, so we can provide variety and have ultimate flexibility, especially when/if permited user traffic increases as well as when/if weather issues force us to use other fields. Feel free to comment about various fields if you are inclined. And I know we've discussed this issue almost ad nauseum, but it never hurts to increase the number of fields in the rotation, and memories are imperfect. 1. I am always right. 2. If I am ever wrong, read rule number 1. Well the Berkeley fields were less than stellar. The 1720 8th street location is probably the best option, with possibly 2730 Hillegass being a bit better. Both would need some aerial analysis / measuring. They're probably both too small, but worth a check due to other upsides. 1720 8th street has a dragged field and nice grass, but again size may be an issue. Is the infield big enough? It seemed like Golden Gate size infield. It's pretty clean, foul poles both sides, outhouse on location, good cage to block foul balls, good location. 2730 Hillegass had a full size infield, but looked like it would possibly be locked up (I was there during recess so of course it was open). RF was marked at 243, but that may not inherently disqualify it from limited usage, depending on the other markers. Anyway, both aren't the strongest leads, but merit at least a quick overhead check. The HR robbery potential at both sites, and their excellent proximity to Oakland, are strong upsides. They both had probably a 25 foot fence in LF, and a 13 foot fence in RF, with the robbable portions being 6' fences in CF. Yeah, I'm going to get Caldecott checked this Sunday before I head over to Curt Flood. It's a nice field and would be good to get into the rotation... stat! That would be a dream come true for me. I threw around on that field once and I've hoped to play there ever since. The backdrop could not be more beautiful. I'm assuming the issues with it would be use by leagues, especially soccer, since it is so nice and if my memory serves me right the infiled was small. Right? Mr. Mcgee don't make me angry...you wouldn't like me when I'm angry!!! Caldecott Park (now North Oakland Regional Sports Center) does indeed have a nice field however it is home to North Oakland Little League and various softball leagues. The main field (the 1st as you walk in ) is almost always in use. The second field is sometimes open but doesnt appear to be very desirable with no fence in left and t he RF fence only about 170 feet away. Fielding East Field in Berkeley (actually Albany as it is on the other side of the Codornices Creek), next to Gabe Gatalfo Fields (E & W soccer) overall is a good size but the infield is short. I work down the street from here and eat my lunch in the parking lot and I used to see a sign highly discouraging the use of the field but as I sit here at work this morning, it is not in use. I also throw into the hat Oakland High baseball field at 580 and Park Blvd. it has a new outfield and I've never seen it in use on the weekends except for O'High football games. Not sure of accesibility. Numerous buslines and an AM/PM across the street. Thanks as always for the quality input everyone. AntMoOAK wrote: Caldecott Park (now North Oakland Regional Sports Center) does indeed have a nice field however it is home to North Oakland Little League and various softball leagues. The main field (the 1st as you walk in ) is almost always in use. Dan M. checked Caldecott availability this morning, and no one was using it. He's checking it again right now to see if it's in use, and also to see how it handled the light rain. Of course, it's practically December, so usage will theoretically be at it's lowest right about now. AntMoOAK wrote: Fielding East Field in Berkeley (actually Albany as it is on the other side of the Codornices Creek), next to Gabe Gatalfo Fields (E & W soccer) overall is a good size but the infield is short. I work down the street from here and eat my lunch in the parking lot and I used to see a sign highly discouraging the use of the field but as I sit here at work this morning, it is not in use. AntMoOAK wrote: I also throw into the hat Oakland High baseball field at 580 and Park Blvd. it has a new outfield and I've never seen it in use on the weekends except for O'High football games. Not sure of accesibility. Numerous buslines and an AM/PM across the street. I heard Oakland High School was all turf now, do I have it confused with another field? I think it was Nick who maybe told me this. 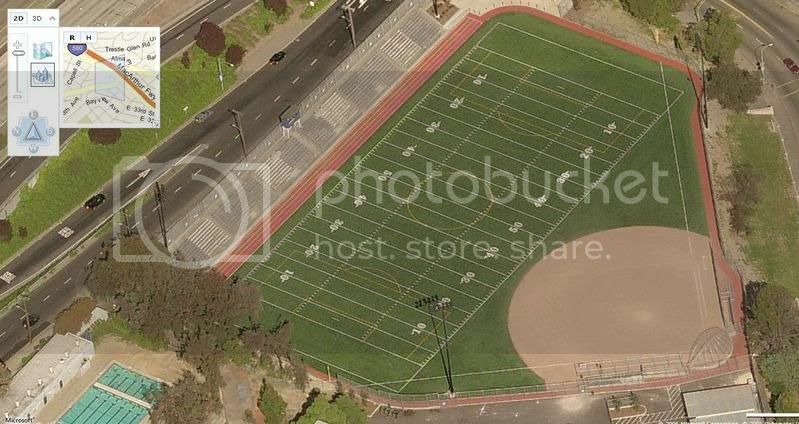 I know Oak HS was renovated in the last year, so that makes me think maybe this was the turf field. Fielding fields are at Approx. 5th and Harrison in Berkeley/Albany. would love to play on the field that is dedicated to Gabe, for sentimental reasons and work reasons, as fifth is right by 4th (maybe a block away). how small is the infield cause i know nichol is a little small but no one notices/cares? Oakland High-- Don't know of its accessibility but it looks nice and is never in use on Sundays. For sure, I'm interested in that field. But isn't it all artificial turf?